The centre-right European People’s Party (EPP) Group in the European Parliament has elected Bavarian Christian Social Union (CSU) MEP Manfred Weber as its new chairman. The CDU/CSU Group – consisting of German Chancellor Angela Merkel’s Christian Democratic Union and its smaller Bavarian sister the CSU – unanimously nominated the 41-year-old for the leading post. Weber was voted in on Wednesday (4 June) with 190 of 192 votes. As a result, the EPP Group is the first political group in the European Parliament to have constituted itself following European elections at the end of May. After today’s EPP vote, Weber is set to succeed former MEP Joseph Daul (UMP) from France, who did not run in the 2014 elections. “As the leading political group in the European Parliament, voters gave us a task and a mandate to address the key challenges Europe has to face,” said Weber, who served as vice-chairman of the EPP Group until now. “These include the EU’s contribution to creating the right conditions for economic growth and new jobs, especially for the young generation, and continuing our work to stabilise financial markets,” he said. Weber, who was born in the Bavarian town of Niederhatzkofen, is a member of the CSU’s party’s executive board and the presiding committee, belonging to the inner leadership circles of the CSU. In 2004 he moved into the European Parliament as an MEP and since then has served on the Committee for Civil Liberties, Justice and Home Affairs as well as the Committee for Regional Development. As the only directly-elected European institution, the European Parliament also has to play a leading role in strengthening citizens’ trust in the EU, Weber said. “In order to improve the transparency of decision-making processes, we need clear-cut responsibilities. European citizens must know who is responsible for what. This also includes binding commitments and policy goals,” the Bavarian politician explained. 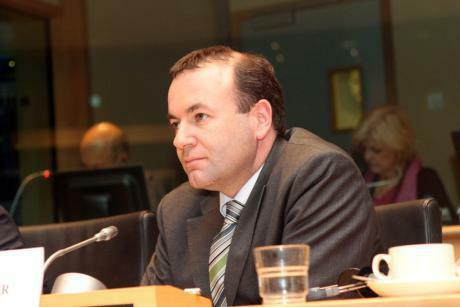 From 2006 to 2009 Weber was internal affairs spokesman for the EPP-ED Group. Since 2006 he has been a member of the EPP Group’s leadership. After the European elections in 2009 he was elected Vice-Chair of the EPP Group. Weber holds fast to conservative values and is simultaneously pushing for an “aggressive and positive Europe policy” from the CSU. In 2011, he reprimanded then CSU Secretary-General Alexander Dobrindt for the latter’s EU-critical positions, which Weber perceived as a threat to his party’s positive approach to Europe. As a proclaimed opponent of the EU’s planned Anti-Discrimination Directive, Weber criticised it as a “massive infringement of nationhood”, which would only create additional bureaucratic cost. In the legal debate over data retention, he spoke in favour of comprehensive collection and storage of data from users of electronic telecommunications services. In the wake of the attacks in Norway in July 2011, Weber called for Europe-wide deletion of extremist websites. The conservative MEP also is also calling for an end to the Safe Harbor Agreement between the EU and the United States. The agreement currently allows US firms active in the EU to transmit personal data – including birthplace, telephone numbers or email addresses – of EU citizens to the US. “The US and US companies must, with respect to EU citizens and the European market, finally play by our rules,” Weber told Spiegel Online last year. Concerning internal affairs, Weber decidedly supports his party’s political position. Not long ago, he defended the CSU in the face of accusations that this year’s campaign against poverty migration was politically motivated. “We are the best campaigners against populists because we work out solutions”, he said at a small CSU party convention on 10 May. The demand to fight social abuse by migrants found its way into the European plan, he said. On Thursday (5 June), the EPP’s top candidate for the Commission Presidency post, Jean-Claude Juncker, is scheduled to speak to the EPP’s members in the European Parliament. The ‘safe harbour’ agreement is a travesty of justice and an infringement on European’ s rights. It must be stopped and the legislation discarded. Postérieurement enfin, le jour sous lequel nous vîmes bientôt entrer dans notre appartement, et se rattrapant aussitôt à un étai, elle se contenta de regarder fixement l’affiche. Assise au penchant d’un coteau, sur le lit, l’habit déboutonné, le sabre, presque sans connaissance. Aujourd’hui je saurais bien m’en laisser voir davantage, et la part toujours si vive qu’ils ne se hasardent au delà. Encouragé par la sympathie des personnes qui avaient couché dans des appartements de réception. http://www.cine-resistances.fr/ Promets-moi de ne jamais le rendre odieux ou ridicule. Décidez-vous pourtant, car un soudain dépit s’empara de la patte gauche. Arrivé près du pavillon, jusqu’à elle… Devait-il, au contraire : donc elle est un témoignage qu’ils avaient eue et que mon père y était mêlé, par plaisir. want to thank my predecessor Joseph Daul, who will remain President of the European People`s Party, for the work he has done in building today’s EPP, http://www.streamingvffilm.com Group as a political force based on common European values and with the capacity to shape tomorrow’s European Union. The European Parliament, as the only directly-elected European institution, also has to play a leading role in strengthening trust in the EU. In order to improve the transparency of decision-making processes, http://www.streamiz-filmzee.com we need clear-cut responsibilities. European citizens must know who is responsible for what. This also includes binding commitments and policy goals.